What did you think of States of Matter ? Matter is all around us. It’s everything that takes up space. There are different states of matter. 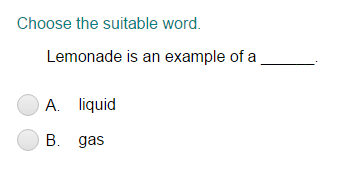 They are solids, liquids, and gases. Solid particles are held together closely. They have a shape. Liquids particles are held together loosely. They don’t have a shape. Gases are not held together. They float away. Matter can change states. Water can change to a solid (ice). It can change to a gas (water vapor). Plasma is a gas that has been heated and becomes charged with energy.